Vin Nardizzi kindly sent me a copy of this excellent collection of essays he has edited with Jean E. Feerick. I'm posting its table of contents here because many readers of ITM will want to peruse it. 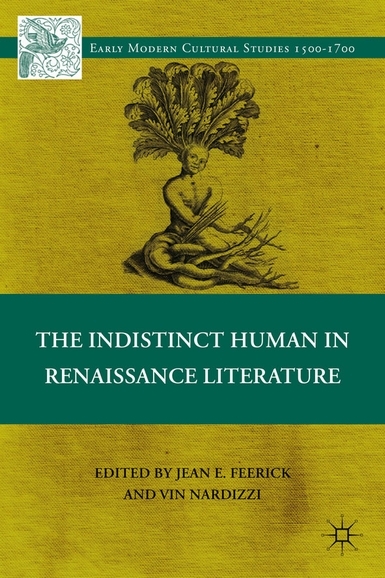 If you enjoyed the inaugural issue of postmedieval on the posthuman, this is the book for you. The introduction is superb: a piece on "Swervings" that is not about Lucretius! "We go back to these Renaissance materials," the editors write, "to locate possible futures" (5). The essays that I've read so far do just that. Like all Palgrave books The Indistinct Human is overpriced ($90), and no ebook has been released. You can save 20% by ordering from Amazon, though (not that $72.01 counts as inexpensive). With its essays on animals, plants and stones, the book is also an unexpected complement to the soon to be released Animal, Vegetable, Mineral: Ethics and Objects (out before Kalamazoo via punctum; free as a downloadable PDF). Here we are a year later and this book is on KINDLE for $72. Still more than this starving student can afford especially since I'm only interested in one article. Medieval Stuff, Over at "Le Prof & La Potiche"